If you like minestrone-you’ll love this minestrone. 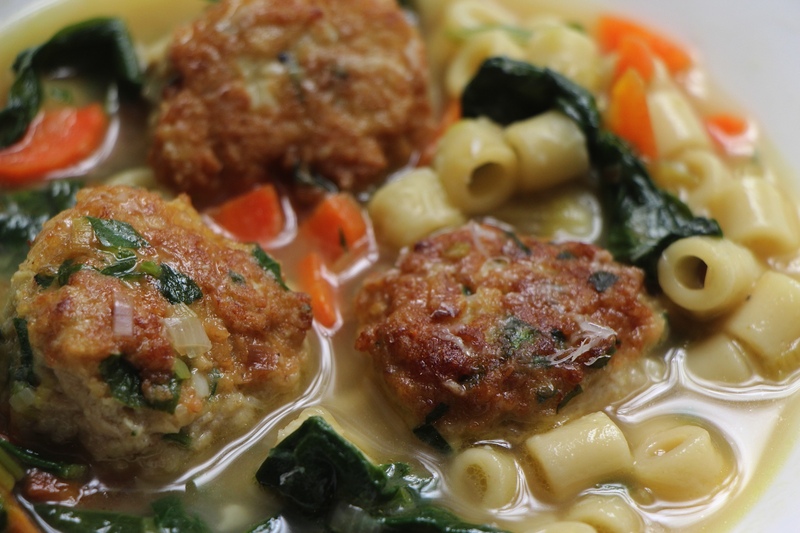 The chicken meatballs cooked in the soup really take this soup to the next level! You can use whatever veggies you like but I found the ones used in this soup to give the best flavor combination! In a medium mixing bowl, combine breadcrumbs, egg, cheese, garlic paste, parsley a pinch or two of salt and a couple of grinds of black pepper. Whisk well. Using your hands incorporate the ground chicken into the egg mixture and mix well. If you’re not sure if the meat mixture is seasoned properly-make a 1” round flat patty and cook it on both sides in a small fry pan with a small amount of oil till cooked through. Let it cool slightly and eat it. Adjust your seasoning with salt, pepper or cheese if needed! Once you have you have your meatball mixture seasoned correctly, form the mixture into 1” balls and place them on a plate sprayed with cooking spray. The mixture should make about 16 or so meatballs. Heat oil in a large skillet over a medium high heat. Add the meatballs and cook until just browned on two sides, about 2-3 minutes per side. The meatballs will not be cooked through and we will finish them in the soup. If needed cook the meatballs in batches. Transfer the meatballs from the skillet to a plate. In a large, heavy bottomed pot (6-8 quarts), over a medium high heat, add oil. Add the leeks and couple of pinches of kosher salt. Sweat the leeks, stirring occasionally, until the leeks have softened and given up most of their moisture, about 8-10 minutes. Add the garlic and cook for another minute or two, until the garlic becomes fragrant. Add the stock, thyme and bay leaves. Let this come to a simmer and reduce heat to medium low. Add the carrots and ditalini and cook until the pasta is not quite al dente, about 5 minutes. Add the meatballs and cook for another 3-4 minutes or until the pasta is al dente and the carrots are tender. Add the spinach and cook until spinach is wilted. Add the cheese, stirring to combine. Taste the soup and adjust the seasoning with salt and pepper.